È stato visto 1514 volte. 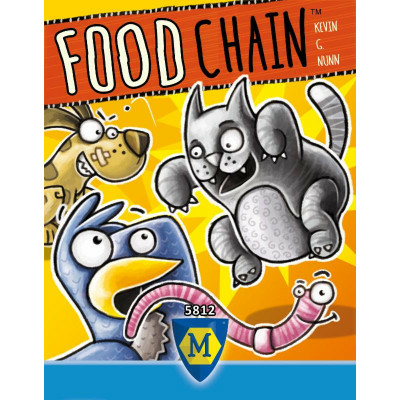 Description from the publisher: Food Chain brings all the animals to the yard! The birds like the worms, the dogs scare the cats, and the fleas LOVE the dogs! Anticipate which animals your opponents will play and counter with the right animals to be at the top of the food chain! Everyone has a set of animals: worms, birds, cats, dogs, and fleas. Each turn, you try to guess what the other players are going to reveal, and hope that you pick something higher in the food chain than them. If you do, you claim their cards as points, but if something is higher than you, they collect your cards from the round. An exciting game of prediction and prey!